“Plate XVII” features ten figures that accompany a section of the text discussing optical illusions and tricks. Figures 52 and 53 depict an illusion using decanters of water and a concave mirror. Figure 54 portrays a room-sized camera obscura with a single lens for use by artists. Figures 55-57 depict a “dioptrical paradox,” an optical illusion involving a multiplying glass or prism. Figure 58 portrays the mechanism used to generate “double perspective,” a trick in which mirrors create the illusion of straight linear sight. Figures 59-61 depict the “Endless Gallery” illusion, in which landscape or other scenes seem to be reflected infinitely by a series of mirrors. Inscr. top left with “Vol. II”; top right with “Optics Pl. XVII”; and lower right with “Mutlow, Sc Russell Co."
“Plate XVII” appears in Charles Hutton’s translation of Jacques Ozanam’s Recreations in Mathematics and Natural Philosophy in Four Volumes. Charles Hutton taught at the Royal Military Academy and was elected a member of the Royal Society of London on June 16, 1773. Jacques Ozanam was elected a member of the Académie des Sciences in 1701. Ozanam’s original text was published in Paris 1694. In addition to Hutton’s translation and revision of the text in 1803, which was reissued in 1814, Montucla’s revised and expanded editions were published in Paris in 1778 and 1709, and E. Riddle published yet another edition, entitled Recreations in Science and Natural Philosophy, in London in 1844. “Plate XVII” in Recreations in Mathematics and Natural Philosophy focuses on instruments and experiments which produce optical illusions and deceptions, all of which are explained to the reader through the physical properties of light. 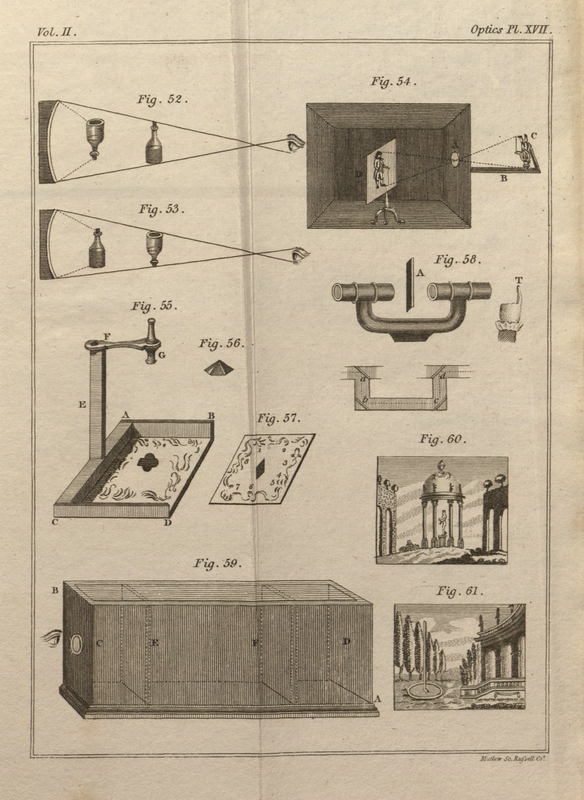 The camera obscura (Figure 54) featured on this plate is room-sized, unlike the portable or sedan-chair camera obscura illustrated on “Plate I” and “Plate II” of the text. Ozanam describes this particular camera obscura as an instrument that is “very useful to painters, artists, &c.” because it can be used to create “a beautiful representation of external objects” on a white screen for an artist to copy (Ozanam 334-35). Positioned here as a device for ephemeral representations but described elsewhere in the text as an instrument of scientific inquiry, the camera obscura is portrayed by Ozanam as an instrument of conceptual and practical ambiguity. Consequently, Ozanam successfully conveys the unstable place of the camera obscura in the formation and articulation of a modern visuality during the Romantic period. As discussed by Barbara Maria Stafford, Hutton’s translated text aligns with an increased interest in rational recreations: popular leisure pursuits which were intended to simultaneously entertain and intellectually edify young people. Recreations in Mathematics and Natural Philosophy is an example of the rapid popularization of these recreational texts in the Romantic period, particularly for use in the domestic space. Helen Groth notes that, in the nineteenth century, the domestic arena “becomes a space of productive labor, where the mind of the child is actively shaped by the rationalizing energies of the family dedicated to the principles of useful knowledge” (161). The ability not only to enjoy the illusions produced by camera obscuras, magic lanterns, and other optical devices, but, importantly, to distinguish the illusory from the real was paramount to the rational recreations agenda. As evidenced in the sustained revision, expansion, and republication of Jacques Ozanam’s original work on recreational experiments from the late seventeenth century to the nineteenth, optical technologies and rational experiments stimulated the Romantic visual imagination and reinforced the emphasis on edification and self-improvement through efforts at practical education in the domestic sphere (Groth 161). The text and its illustrative plates demonstrate how to create optical instruments for recreational scientific experiments. Crary, Jonathan. Techniques of the Observer: On Vision and Modernity in the Nineteenth Century. Cambridge, MA: MIT Press, 1990. Print. Groth, Helen. “Domestic Phantasmagoria: The Victorian Literary Domestic and Experimental Visuality.” South Atlantic Quarterly 108.1 (2009): 147-69. Print. Hammond, John. H. The Camera Obscura: A Chronicle. Bristol, UK: Hilger, 1981. Print. "Memoir of the Late Dr. Hutton." The Gentleman's Magazine: and Historical Chronicle (March 1823): 228-32. ProQuest. Web. 2 Mar. 2009. O'Connor, John J. and Edmund F. Robertson. "Jacques Ozanam." MacTutor History of Mathematics Archive. JOC/EFR, Aug. 2005. Web. 19 March 2009. Ozanam, Jacques. Recreations in Mathematics and Natural Philosophy in Four Volumes. 1694. Trans. Charles Hutton. London: Printed for G. Kearsley by T. Davison, 1803. Print. Stafford, Barbara Maria. Artful Science: Enlightenment, Entertainment, and the Eclipse of Visual Education. Cambridge, MA: MIT Press, 1994. Print. --- . “Revealing Technologies/Magical Domains.” Devices of Wonder: From the World in a Box to Images on a Screen. Ed. Barbara Maria Stafford and Frances Terpak. Los Angeles: Getty, 2001. 1-115. Print. Warner, Marina. “Camera Lucida.” Eyes, Lies and Illusions: The Art of Deception. Ed. Laurent Mannoni, Werner Nekes, and Marina Warner. London: Hayward Gallery/Lund Humphries, 2004. 13-23. Print. Jacques Ozanam, Recreations in Mathematics and Natural Philosophy in Four Volumes. Plate XVII: Optical Illusions and Tricks, engraving, 21.8 x 13.5 cm, inscr. top left with “Vol. II,” top right with “Optics Pl. XVII,” and lower right with “Mutlow, Sc Russell Co.,” UW Department of Special Collections.